Today’s card is for The Library Challenge where the inspiration is The Hobbit! Squee! I’m fairly certain it is obvious, but my inspiration is Smaug. I found a free clipart image of a pile of gold coins. I printed it and hand-cut it out. The cute lil dragon was colored with Copics. After that I wasn’t sure what I was going to do. Finding a sentiment so that I could actually use the card, but that made sense with the image was a challenge. After struggling with how to put it all together, I found the layout in my inspiration file. It is an old Two Peas in a Bucket sketch. 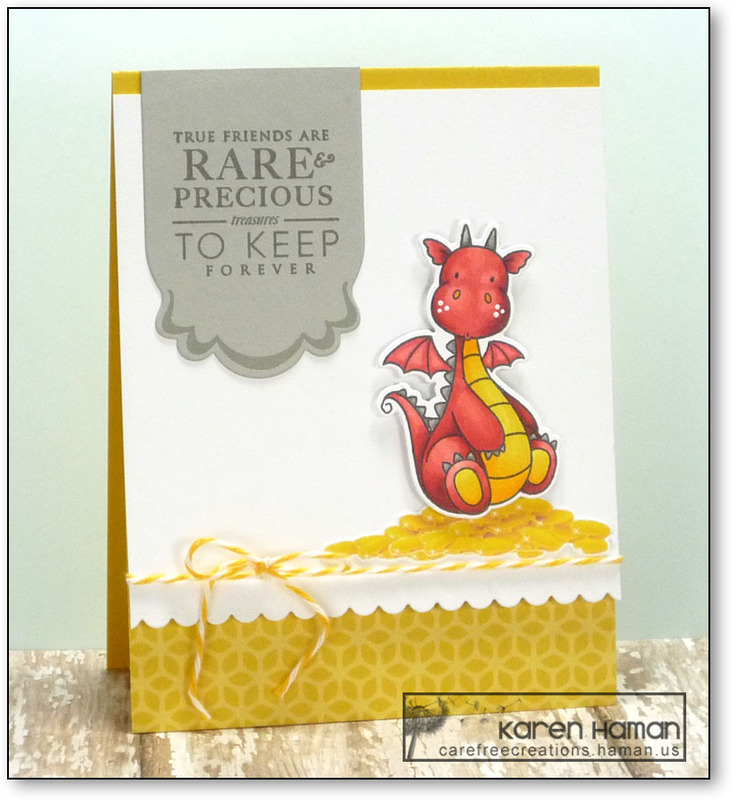 This entry was posted in cards, My Favorite Things by karen h. Bookmark the permalink. Oh I love this! How wonderful to make the pile of coins. The dragon is cute and beautifully coloured. I know what you mean about the sentiment. I have some lovely stamp sets with great punny sentiments that I cannot imagine ever sending to anyone! Thanks for joining The Library.